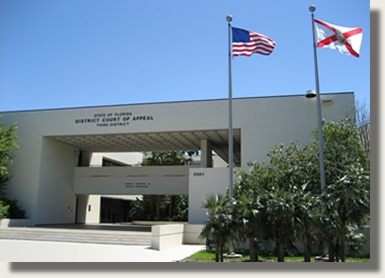 In a recent opinion released on July 23rd by the Third District Court of Appeal, the appellate court ordered approximately $99,500 in surplus funds to be returned to Miami residents Walter and Eider Pineda. The ruling reverses a trial court order which directed the funds to be applied as payment toward the balance owed to the first mortgage lender, instead of being disbursed to the Pinedas. A review of this interesting ruling reveals that it was more of a case of the foreclosure auction buyer (third-party purchaser) making mistaken assumptions rather than a novel legal argument, but nonetheless the result is a huge amount of foreclosure surplus going to the ex-owners of the property despite their non-payment of both the first and second mortgages. While we are sympathetic to Nocari’s equitable argument, the fact remains that distribution of surplus foreclosure proceeds is governed by a plain and unambiguous statutory procedure which clearly provides that the owner of record is entitled to the surplus proceeds. Where the legislature has provided such a process, courts are not free to deviate from that process absent express authority. Neither the statutes nor the case law governing distribution of surplus foreclosure sale proceeds provides a mechanism authorizing a third-party purchaser to obtain the surplus. The statute is clear: the owner of record at the time of the recording of the lis pendens is entitled to any surplus proceeds . . . Nocari was neither an “owner of record,” an assignee of an owner, nor “subordinate lienholder,” . . . and thus was not entitled to any surplus funds. While there was no community association involved in this case, the ruling highlights some important reminders for associations as well as third-party purchasers. For the community associations, the ruling should serve as a reminder of the importance for condominium associations and HOAs to preserve their ability to collect surplus funds generated by foreclosure sales. Community associations are often named as subordinate lienholders in mortgage foreclosure cases, and they should engage counsel to closely monitor the status of such cases, file appropriate responses to protect their interests and entitlement to surplus generated by the foreclosure sale, and file timely motions with the court so they are not barred from collecting foreclosure surplus. For the third-party purchasers, the ruling illustrates the importance of performing due diligence and working with qualified legal counsel in order to act with certainty and understand the complete ramifications of their bids at foreclosure auctions. I, along with our firm’s other community association attorneys, work very closely with our clients on foreclosure cases and motions for surplus to ensure that their lien rights and ability to collect as subordinate lienholders are protected. We monitor and write about important legal and business issues affecting Florida community associations in this blog, and we encourage association directors, members and property managers to submit their email addresses in the subscription box at the top right of the blog in order to automatically receive our future articles.